Any regular reader will know that I don't have much patience with the notion of women's and men's scents. In an ideal world, there would just be scents, and we'd wear what made us happy. But culturally there is a (somewhat permeable but occasionally strictly observed) divide between scents which are considered appropriate for the sexes, and I'm not immune to the potency of those strictures. I think I ignore them more than most men do, but I find I can't entirely disregard them, alas, however hard I try. I was once told by a man that MPG's Ambre Precieux must be a woman's scent, couldn't be a man's, because it was mostly ambergris and men can't wear ambergris--despite the fact that MPG's women's scents are packaged in clear glass bottles while men's are in red glass, and AP is in red glass, QED. One of the signal qualities of most oriental scent-notes is that they're inherently sexless: warmth smells good on anyone. AP ought to have been marketed not as a men's scent, but as an anybody scent. I've long been hunting for a really beautiful rose scent that I felt I could wear with impunity. In Western culture, a strongly rosy scent is considered a floral for women, but in other cultures it's a masculine scent, so obviously there isn't some inherent quality to the rose that makes it womanly. And there are flowers that are considered masculine--lavender makes an appearance in many men's fragrances, and geranium and violet show up more than you might expect. There are rose scents for men, usually made dark and earthy to take the curse off. L'Artisan Parfumeur's Voleur de Roses achieves this earthiness with quite a lot of patchouli; unfortunately, it smells disgusting on me. Despite the name, the scent is much more about patchouli than about roses, and I don't like L'Artisan's version of patchouli--their Patchouli Patch is equally horrible to my nose. I was looking forward to trying Tishka by Florascent: it's a unisex rose scent meant to evoke a Moroccan bazaar, and the spices (listed as pimento, clove, and ginger) and the base notes (benzoin, opoponax, and orris) made it sound luscious. I should have known. The top note is a clatter of dry spices and, immediately, the rose note. The spices soon resolve themselves into what is without a doubt curry powder (it calls to mind Joseph Abboud's only men's scent, which also had a curry note, though much subtler than this), and for a solid hour, what you smell on your skin is curried rose petals and nothing more. I don't doubt that there's a market for curried roses, and surely some people like it, but the result, to my nose, is not altogether pleasant. It's faintly horrible, in fact. I kept catching whiffs of it and recoiling a little. Recoiling from myself! That's not what a fragrance is supposed to make you want to do. As the curry scent eventually, at long last, begins to burn away, those warm base notes finally show up. A trace of the dry spices remain and a little of the rose note, but mostly you have a lovely oriental base of warm, sweet benzoin and opoponax. It's very attractive, but I can't see that it's worth waiting through that stewpot to get to. Tishka is not a bad scent; it's not cheaply or hurriedly made. Obviously a great deal of care went into its composition: the perfumer had a vision of what the scent was to be, and I'd have to say that she or he succeeded. I just don't care for the result, that's all. If the curry had been toned down drastically so that the rose had a chance to shine, if the scent had been more like the drydown except with a heightened rose note, then I have a feeling I'd have fallen in love with this. On the whole, mass-market scents these days just aren't very good. Nearly all of them are copies of one another, products of mere market analysis with little if any artistry to them. That's why it's always such a surprise when I find one that I like. Guess Suede isn't an instant classic. It probably isn't going to stand the test of time; I can see its being sold for two or three years and then retired to make room for a bunch of other Zeitgeisty scents in the Guess stable. (The only scent of theirs I ever thought was worth a damn was the original women's scent, back in 1990, and even that wasn't great, just novel for its time.) But despite that, I find I'm really enjoying it. It's different enough from the mainstream of men's scents to stand out, at least a little. It opens with a vivid gust of citrus and pineapple, followed rapidly by the spicy core of nutmeg and sage in a bath of lavender. It's a true, slightly camphoraceous lavender, too, brightened with some synthetics but skillfully avoiding the fresh-ozonic trend that's so relentless and hateful these days. The spiciness outlasts the lavender, leading to a warm oriental base. After a little while, a warm suede note comes sauntering up, joined by piercing vetiver which is rounded out by sandalwood. None of this sounds especially revolutionary; I think it's the proportions of the ingredients, rather than their novelty, that make the whole composition work, but it does work. The drydown, which lasts for a few hours (it's not an especially long-lived scent), is cozy, but kept from being too sedate by that vetiver. It's in the house bottle, a large, blocky, stylized "G" with a brushed finish. 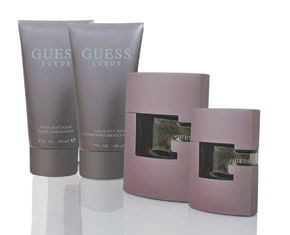 I thought the Guess bottles were cheap and obvious when they were first launched (the women's is a taller, curvier version of the "G"), but I confess that I like this one; the muted colour of the juice (the original was a bright green) and the finish of the bottle make a more adult presentation. It isn't a scent for a serious collector, I think; once you've smelled and worn hundreds of scents, you get either jaded or sophisticated, and you need things that are out of the ordinary. But there's nothing wrong with Guess Suede. It's well-made, pleasant, and different enough from the mainstream to stand out, at least a little. I can't believe I'm being such a sucker for something which is surely meant to appeal to 18-to-35s everywhere, but I can't help it. I just like it. 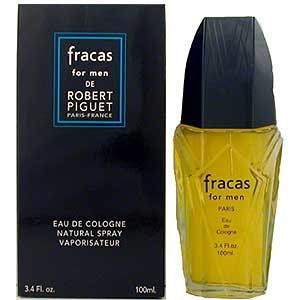 I'm not a big fan of large quantities of tuberose, so I don't much like Fracas. I don't actively hate it, the way I hate Carolina Herrera and Versace Blonde, but I don't...get it. Something else I don't get is Fracas For Men. I didn't even know such a thing existed until a couple of weeks ago, and now I have a sample of it, and I don't really see the point of it, at all. First of all, I hate the bottle. You know those knockoff scents, the ones you find in discount stores that say "Our version of Drakkar Noir" or whatnot? This bottle looks exactly like one of those. From the look of it, it couldn't really be any cheaper. Second, why would you want to make a Fracas for Men? 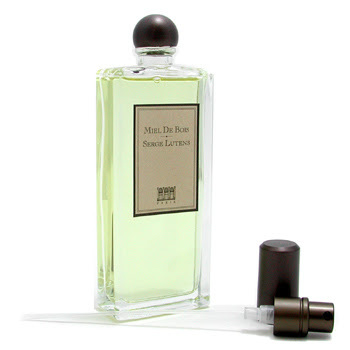 The original is so completely wedded to a time and the idea of a scent--brilliant, potent 1940s tuberose--that tacking the name onto a men's scent, any scent at all, makes no sense whatever. Third, the product itself might not actually be legitimate. According to the fragrance blog Bois de Jasmin, a company named Fashion Fragrances and Cosmetics has licensed the Robert Piguet name to produce his scents (including the famous Bandit). However, according to BdJ, FFC is not selling anything except perfume and eau de parfum concentrations, so anything else under the Piguet name, which is to say an eau de toilette or eau de cologne, is actually a counterfeit. This could well explain the existence of Fracas for Men (and also Bandit for Men, which I haven't tried). And fourth and finally, the scent itself. It really just isn't that interesting. It isn't awful; it smells mostly of lavender, soap, and, in the drydown, lots of vetivert and sandalwood. But it sort of smells like copies of other men's scents. In fact, it really seems a lot like Rive Gauche Pour Homme without the patchouli. With that bottle, if you found it at a discounter for three dollars in a box bearing the legend "RAVE GUY: Our version of Rive Gauche", you wouldn't be a bit surprised. Here's my Demeter story, a tale of good customer service. I placed an online order on June 16th. I had read on Now Smell This that Demeter made 11-mL bottles (that's about a third of an ounce) for the bargain price of $3 U.S., and that they were phasing them out at the beginning of July in favour of a half-ounce bottle for $5. Since Demeter makes something like 200 scents, and I owned about a dozen and had always coveted more, I figured this was my chance, so I went to their website and before I knew it had ordered twenty of the miniatures, some I was sure I'd love and some I wanted to try because at that price, if it's a dud, you don't feel too bad. Two weeks later I still hadn't received anything, so I wrote them a nice inquiring e-mail. A week after, on July 5th, I still hadn't heard anything so I wrote another e-mail, still polite but a little more anxious, if not actually annoyed. Two days later I received notification that the package had been shipped that day, which did annoy me, because it shouldn't have taken three weeks to put together an order. I was at least happy that they were on their way. Then later that day I got an e-mail from the CEO apologizing for the mix-up; the package had been lost in transit by UPS, so they had done it up again and shipped it out as soon as they figured out what had happened. They were also going to refund my shipping charges, and there was a $10 gift certificate attached to the e-mail. So despite the fact that I ought to have gotten a response right after my first e-mail, I have nothing but praise for the company. There are two things about Demeter scents. First, they hardly ever have any real lasting power. Some of them are gone in a matter of minutes, while others can last an hour or two--rarely ever more than that. Second, they're meant to smell like a very specific thing--a drink, a dessert, an object, a place--so there's generally none of the development we associate with created scents. Still, within these limitations, there's a lot to be said for them. Most of them are an instant blast of delight, short-lived as so many pleasures are. They're generally very accurate, sometimes flabbergastingly so, as in Gingerale. And they're just plain fun. Demeter Gin & Tonic is spookily realistic for about ten seconds. 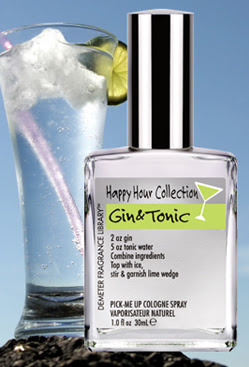 It smells convincingly of juniper--the main flavouring ingredient in gin--and of the bitter sweetness of tonic water. Then the juniper mostly boils away, and what remains is pretty much sweetened lime (because there will be a wedge of lime perched on the edge of your glass), with a little of the bitterness of the tonic and of the lime's pith. It smells like a rather simplistic men's cologne; in no way unpleasant, but it's a shame that the G&T-ness of it is so evanescent. I'd like it to smell like one for longer than it takes to drink one. I have never smelled a lilac scent that was convincingly lifelike. Either the lilac essential oil doesn't survive intact the process of extraction, or the synthetics used in its creation simply aren't complex enough to capture the gorgeous summer freshness of the real thing. 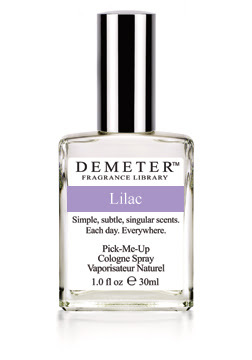 When I first smelled Demeter Lilac, I was extremely disappointed, because it smelled as synthetic as all the rest. And then after a minute or two, a magical thing happened: as if a picture of lilacs had dropped away to reveal a bunch of real lilacs, the synthetic quality vanished and what remained was fresh, creamy, alive--the real thing. It is absolutely wonderful, a little splash of early summer in a bottle. After a time, the freshness diminishes, and it begins smelling again like a synthetic lilac. But for that little while, it's just the best lilac scent I've ever smelled that didn't come from a handful of fresh flowers. I have never smelled a Meyer lemon, but, said to be a cross between a standard lemon and a mandarin orange, it is supposedly sweeter and less acidic than the usual supermarket version. 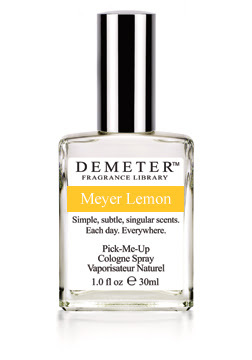 Demeter Meyer Lemon starts out with a stunning blast of lemoniness; it's thrilling in its brightness and severity. And once again, as you have probably predicted, this lemon note burns away; it would have to, because something so ferocious has to burn itself out. What's left is the bitter aroma of lemon peel and pith and a surprisingly dark greenness, a camphoraceous leafy smell. I really love it.